We finally get to the main event. According to Razer, its handset is created to serve a singular purpose - be the best gaming/multimedia handset out there. A tough mission, if we ever saw one, yet Razer seemed pretty confident at the unveiling event. Synthetic benchmark numbers were even quoted, along with lofty claims, like: "The best thermal performance in a smartphone". 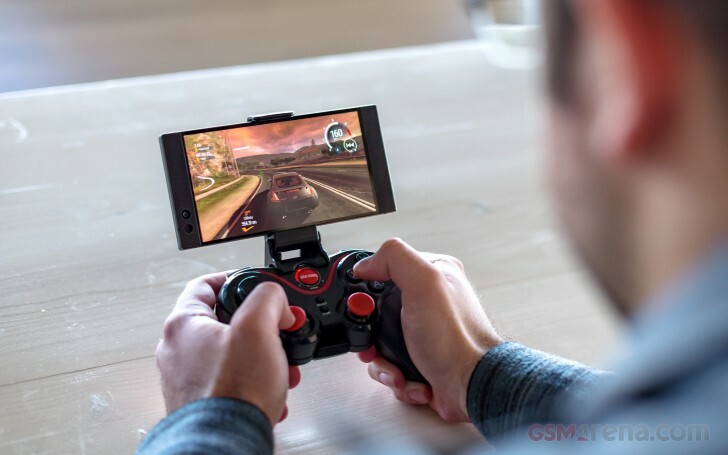 While the PC gaming crowd might be pretty accustomed to such cocky overstatements, on the smartphone scene, manufacturers tend to be a bit more conservative in their wording overall. The simple truth is that the number and possible variations of internal smartphone components is still nowhere near PC standards. That leaves little room for overly unexpected performance variance as a whole. The Razer Phone is powered by the same Snapdragon 835 we have already seen and thoroughly tested in most of this year's flagship devices. Naturally, Razer decided to throw the 8GB RAM number around as well. Like we have said before, it is hardly a game-changer within the current state of the Android OS, resource management and typical mobile app loads. Plus, when you throw a conveniently big memory figure like that in our face, you better be ready to defend your choice of storage options. In this case, only one - 64GB, which, frankly, is hardly impressive when you are pitching your product to gaming and multimedia enthusiasts. To be fair, most of our frustration with Razer's PR likely stems from its, for lack of a better term, "gamer-friendly" approach to marketing. So, we'll give it a rest and move on to the actual benchmarks. The Snapdragon 835 chipset performs exactly as expected. No "secret sauce" or magical performance boosts in sight, but that's alright with us. Perhaps, if Razer had thrown in a Chroma-compatible logo on the back, the numbers might have been a little different. Kidding aside, more compound benchmarks, like AnTuTu paint the exact same picture. Again, don't get us wrong, it is a worthy 2017 flagship picture, but not nearly as "insane" as Razer seems to perceive it. The exact same goes for Basemark OS 2.0. Since there are no surprises thus far, we will use this opportunity to comment of the allegedly amazing cooling solution. While the phone never actually throttled, at least not during our tests, it got really hot. Using the large metal unibody as a heat spreader might very well be beneficial for cooling the internals, but this also leaves you with an unpleasantly toasty phone to hold in long gaming sessions. For many out there, especially laptop gaming fans this might be a fair trade-off. Plus, if you opt for a nice Bluetooth controller solution, like we did, it becomes a non-issue. It really is a shame Razer isn't offering any such accessories of its own. At least not yet, that is. Having tactile controls is a definite advantage in most gaming situations, so, hopefully, we get to see some proper accessories soon. Speaking of which, it is high time we moved to graphics performance, since this is what most of you likely came here to see. Plus, we do have quite a bit of actual gaming experience to share with you. But first, synthetics. These are, well, as expected. Again, the Razer phone does not have the benefit of any mysterious new silicon. It just manages to leverage the Snapdragon 835 and its Adreno 540 GPU perfectly adequately to be on par with the competition. It is worth noting that, as per our usual methodology, the tests were all carried out at the native QHD resolution of the panel. This takes its toll, as expected, in on-screen rendering. 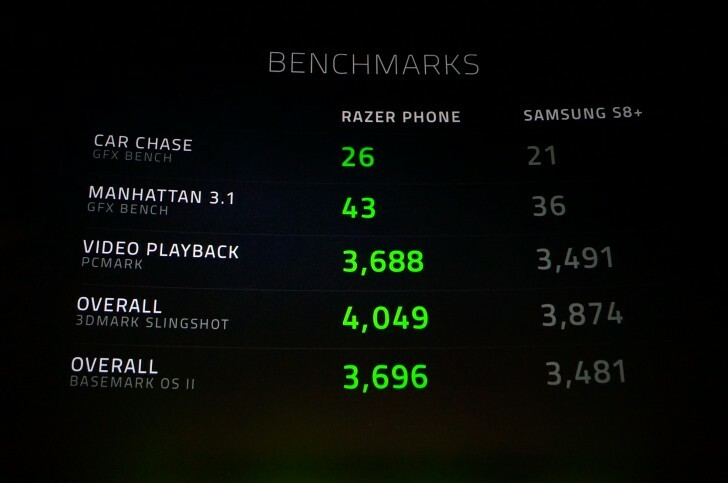 We also can't help but remember a few benchmark numbers Razer shared on stage at the unveiling. Hopefully, this doesn't come off as senseless bashing, since it isn't intended as such. Synthetics are far from exact science and a quick glance at one of the big online score databases proves you can stretch these scores a lot in both directions on any hardware. In real world terms, the Razer Phone is not any better or any worse at performing these artificial tasks than the Samsung Galaxy S8+. And it would probably be in Razer's best interest to ease off on the convenient numbers and lofty claims at least a bit if it plans to stick around on the mobile scene and build a respectable image. But, what happened to the promise of ultra-smooth 120Hz goodness? Valid question and one we made sure to test thoroughly. Besides getting to play games at work, we did actually pinpoint what we think are a few interesting details about the new ULTRAMOTION display. From the very get-go Razer mentioned 120Hz on stage, we have been incredibly suspicious of the claim. Firstly, however, we have to give credit where credit is due, Razer definitely managed to optimize its Android UI to take full advantage of the variable, high-refresh rate panel. Every motion looks buttery smooth. And it's not just system animations. Every scroll on a web page instantly results in a rendering fps hike all the way up to 120 fps and an incredibly sharp scroll effect. No blurring or tearing whatsoever. Browsing on the Razer Phone is a great experience, even if most multimedia content online is still played back at 30 fps. Plus, every intermittent moment before the hardware manages to react to the motion and ramp up the fps count, everything remains perfectly smooth as well, thanks to the variable refresh rate. As for the suspicion part, it mostly stems from our fairly extensive experience with Android and the fact that it is simply not adapted to handle anything beyond 60 fps. And it's not necessarily that the Adreno 540 is not powerful enough to push all the frames, it's just that most of the existing app ecosystem, including game engines, is not designed to work under such conditions. Perhaps a second "Project Butter" will happen at some point to make that a reality, but currently, Razer is stuck in a mostly unfavorable early-adopter position. This is Arena of Valor - one of the games Razer showcased on stage, as a title specifically optimized to take advantage of the Razer Phone's hardware. The little green frame counter is actually a built-in debug function, which was incredibly convenient and ensured our tests were as accurate as possible. At native resolution, the game only managed to get as high as 50 fps on occasion. Far from the 120 mark, required to saturate the full 120Hz refresh potential of the panel. So, our first instinct was to lower resolution. We briefly touched on this in the software section, but to re-iterate, the Razer Phone has two sets of resolution and frame rate/refresh rate controls. One of these is in the display settings menu and affects the resolution of the entire OS and the refresh rate cap of the panel. The other is within Game Booster and can be set on a per-app level. After a lot of experimenting, we discovered these seem to be separate from one another. So, in order to avoid weird small window glitches or touch input problems, we advise you to change them in sync. To give the chipset the best possible chance, we set the CPU frequency to the max 2.36 GHz, left the 120 fps cap and proceeded to lower resolution. All that work and literally no fps gain. That can only mean one thing - the game engine is just not designed to push any more frames. Bummer. 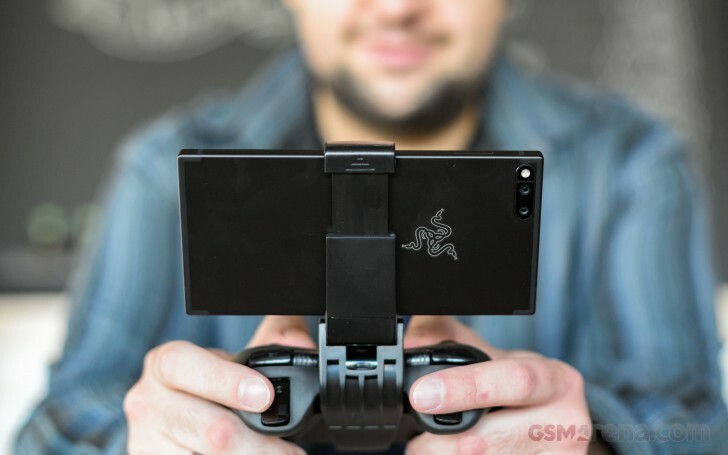 How about Gear.Club - another title Razer ships with its Phone pre-installed. Well, with it, we did manage to get higher fps readings in the 75 range, but again, literally no change with resolution. Still, we count that as progress, since it does prove engines differ from one another in their fps cap. On to the Google Play store then and the top games chart to start the hunt. Asphalt 8? No, not really. DeadTrigger2? Perhaps the Razer likes zombie-mashing better. No, 40-ish cap again, regardless of resolution. OK, perhaps we are going about this the wrong way. Maybe these heavy 3D games are purposefully built with more restrictions in place to ensure performance. So, we tried some simpler graphics titles. CrossyRoad can easily do 60 fps, but not any more. We tried mixing things up in the settings department one more time, just in case. So, we left the system at QHD and only changed the internal game render resolution through Game Booster. Still no luck. OK, enough teasing, in case you were wondering, yes, games capable of pumping out 120 fps do exist. Alto's Adventure is one of them and it looks even better with the extra fluidity of motion. Sadly, it's not something we can show you, since we would have to record the footage at 120 frames and you would have to watch it on a 120Hz monitor. So, you have to take our word for it. Once you try high refresh rate gaming, especially on a variable refresh rate platform, you never want to go back. Another title we managed to find was BADLAND2. Out of all the games we tested, it also behaved most like a PC title, as in, lowering the resolution actually helped it keep 120 fps easily and more comfortably. All things considered, Razer's coveted headlining feature for the Razer Phone, the 120Hz refresh rate, is far from a game-changer at this point in time. Actually taking full advantage of it is a wild goose chase. To prove our point further, we went one step deeper down the rabbit hole and tried to find other titles from the studio that made Alto's Adventure, hoping to stumble on some consistency. Unfortunately, even that is not a foolproof strategy, since Leap On! only went as high as 70 fps. We also looked into remote play for some of our favorite PC games on the Razer Phone to potentially take advantage of the high refresh rate. A couple of solutions do exist, like Nvidia's Game Stream with a compatible client (Moonlight). Unfortunately, all the apps we checked out are currently capped at 60 fps for one reason or another. Perhaps, we'll see how things evolve over the following months. Here's hoping Razer releases a solution of its own, perhaps accompanied by a gamepad accessory for the best possible experience.